Get some historical perspective at 9/11 Memorial and Ellis Island. Head to Fifth Avenue and Shopping Girlfriend NYCfor some retail therapy. There's lots more to do: admire the masterpieces at The Metropolitan Museum of Art, get a new perspective on nature at American Museum of Natural History, don't miss a visit to Central Park, and wander the streets of Times Square. To see reviews, maps, photos, and tourist information, refer to the New York City trip planner . Boracay, Philippines to New York City is an approximately 26-hour combination of ferry, flight, and bus. You can also do a combination of ferry, bus, and flight; or do a combination of ferry, bus, and flight. The time zone difference when traveling from Boracay to New York City is minus 13 hours. Expect slightly colder weather when traveling from Boracay in May: highs in New York City hover around 24°C, while lows dip to 15°C. Cap off your sightseeing on the 11th (Sat) early enough to travel to San Diego. For shopping fun, head to Gaslamp Quarter or Spanish Village Art Center. 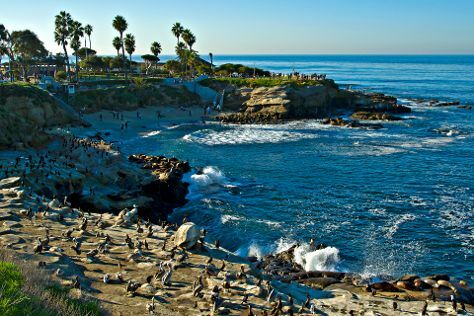 Get outdoors at La Jolla Cove and San Diego Zoo. You'll find plenty of places to visit near San Diego: Del Mar City Beach (in Del Mar), Ranch Santa Fe Golf Course (in Rancho Santa Fe) and Lions, Tigers & Bears (in Alpine). The adventure continues: immerse yourself in nature at Torrey Pines State Natural Reserve, kick back and relax at Mission Beach Park, take a tour of Maritime Museum of San Diego, and see the interesting displays at USS Midway Museum. For traveler tips, other places to visit, and more tourist information, read our San Diego travel planner . You can do a combination of bus and flight from New York City to San Diego in 8.5 hours. Other options are to fly; or drive. The time zone difference when traveling from New York City to San Diego is minus 3 hours. Traveling from New York City in May, San Diego is somewhat warmer at night with lows of 19°C. Finish up your sightseeing early on the 22nd (Wed) so you can go by car to Los Angeles. Let the collections at The Getty Center and Griffith Observatory capture your imagination. You'll get in some beach time at Venice Beach and Boardwalk and Will Rogers State Beach. Change things up with these side-trips from Los Angeles: Manhattan Beach (in Manhattan Beach), Santa Monica (Montana Avenue & Third Street Promenade) and Disneyland Park (in Anaheim). And it doesn't end there: enjoy the sand and surf at Royal Palms State Beach, steep yourself in history at Hollyhock House, take in the exciting artwork at Hammer Museum, and get a new perspective on nature at La Brea Tar Pits and Museum. For photos, ratings, traveler tips, and more tourist information, you can read our Los Angeles route app . You can drive from San Diego to Los Angeles in 2.5 hours. Other options are to take a bus; or fly. May in Los Angeles sees daily highs of 28°C and lows of 17°C at night. Finish up your sightseeing early on the 3rd (Mon) so you can travel to Las Vegas. Do your shopping at The Strip and Forum Shops at Caesars Palace. Get in touch with nature at Red Rock Canyon National Conservation Area and Escape Adventures and Las Vegas Cyclery. Get out of town with these interesting Las Vegas side-trips: Valley of Fire State Park (in Overton), Willow Beach (in Fort Mohave) and Hoover Dam (in Boulder City). Spend the 14th (Fri) riding across the waves with a waterskiing or jet-skiing adventure. And it doesn't end there: don't miss a visit to Bellagio Fountains, try your luck at Casino at the Venetian, enjoy some diversion at Paris Las Vegas, and see a show at Casino at the MGM Grand. For maps, more things to do, traveler tips, and tourist information, refer to the Las Vegas trip itinerary site . You can fly from Los Angeles to Las Vegas in 4 hours. Other options are to drive; or take a bus. While traveling from Los Angeles, expect much hotter days and a bit warmer nights in Las Vegas, ranging from highs of 46°C to lows of 29°C. Finish your sightseeing early on the 14th (Fri) to allow enough time to travel back home.